And NOW I'm letting you guys know about another contest that is coming up- and this time I won't be entering, but my blog (along with several of the Misfits' blogs) will be hosting some of the entries!! 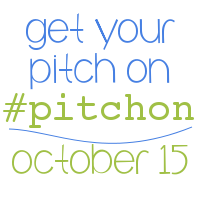 The lovely Sharon M. Johnson is hosting the Get Your Pitch On contest! Here are the details, straight from Sharon's blog! Pitch: Seventeen-year-old Mishca Richardson is a sleeper soldier with a weak heart. She has no idea that a life saving heart transplant has accidentally triggered her programming. In the search for answers, she discovers the truth and that her creator, Wirth, has classified her remaining "sisters" from her experiment group as defective, scheduling them for termination. Mishca sets out to save them before they're eliminated. Just as it's important to get someone else to look over your manuscript before you query, it's a good idea to get feedback on your pitch before you post. We have about twenty blogs who are ready to help you hone your pitch. These workshops start on October 1 and you can find the list of blogs participating here. Wow! Sounds like a great opportunity. I'll pass it on. So glad to hear you got some agent-love for your MS, too. Good luck with it!